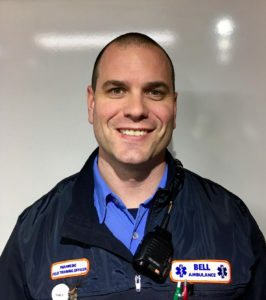 Dave is now a Critical Care Paramedic and Field Training Officer at Bell Ambulance. Dave came to Bell Ambulance in 2014 as a seasoned Critical Care Paramedic, having worked at other services. While Dave hasn’t been with Bell Ambulance for very long, his impact is undeniable. Dave’s positivity and calmness is felt throughout the entire Bell Ambulance staff. In every critical situation that Dave steps into, he brings with him a demeanor that is both calming and insightful. From day one of his employment, Dave started to teach what he knew to those around him. Dave makes a point to speak to BLS providers after every call, to answer any questions they may have about the treatment he gave, and to teach them exactly why he performed said treatments. Numerous EMT-Basics have been inspired to pursue a Paramedic education, simply due to Dave’s attitude towards his team and career. It didn’t take long for the management team at Bell Ambulance to recognize Dave’s talent. Dave was a perfect fit to become a Field Training Officer. Though Dave now trains Paramedics and Critical Care Paramedics; however, he hasn’t forgotten his roots. Dave still reaches out to any EMT-Basic he sees to offer the tips and tricks that he has acquired over his career. Dave’s natural talent for teaching is so well recognized that, only one year after starting at Bell Ambulance, his fellow co-workers voted Dave the Employee of the Year for 2015. In addition to being incredibly well-liked by his team, Dave also gets frequent compliments from his patients. The calm, professional demeanor Dave brings to each scene is witnessed by patients, caregivers, and family members every day. In addition to teaching, Dave is quite adept at learning as well. Dave has ambitions of EMS management someday, and is always trying to learn every aspect of the business. From supply to billing, Dave is always asking somebody how the system works. Dave has a bright future ahead of him! In only a couple short years, Dave has made a significant impact to the staff at Bell Ambulance, transforming the attitudes of the people he works with. This undoubtedly earns him recognition as a Star of Life. Dave is married and is a full-time father to two children, ages six and four.